There can be many reasons underlying the Google Chrome Update Server Not available error and these issues are represented in different codes, listed as Codes; 1,3,7,10,11, and 12. Any of these errors may show up when you try to update Google Chrome browser and it is usually represented as “Update server not available” followed by the error code number. These error code numbers vary depending on the kind of Operating System you are on,; Error 3 is more common with Windows Operating System while error 12 is predominant in Mac Operating Systems. [highlight color=”eg. yellow, black”]Error 1[/highlight]:This error code number shows up when a Google chrome update server is not available, and is due to the transfer of installed Google Chrome files from their originally installed location to another place, which eventually interrupts with the update. This problem can be fixed simply by un-installing all Google chrome files, followed by a re-download and re-install. If this does not work, as a last resort you can then you remove and re-download/reinstall the original version of Google chrome. [highlight color=”eg. yellow, black”]Error 3[/highlight]: This error is the most commonly encountered Google chrome server update error on Windows Operating Systems. This error mostly presents itself because of administrator-related right issue. Normally, the administrator has no right or privilege to update Google chrome on any web browser, and when you try to log in as an administrator instead of a regular user, the Google chrome server update will stop working. To fix this problem, you need to log out as an administrator and then log back in as a regular user. Open your Google chrome browser and then update. The odds are pretty thick that your Google Chrome will behave normally afterwards. However, if even after updating through a regular user account the updater still isn’t working, you will need to download and run an alternative installer. Running an installer will automatically enable Google Chrome to fix the problem remotely. [highlight color=”eg. yellow, black”]Error 7[/highlight]: This error occurs when you successfully download a Google chrome server update but it fails to install on your computer. To fix this error, first of all, restart your computer. Press “CTRL + ALT +DEL” when your Computer has rebooted and then open the Task manager. Under processes tab, several system processes will show up, look up for a process named GoogleUpdate.exe , if you find it, then try updating the Google chrome server from the browser but if the problem persists, you will need to un-install the Google chrome version , download a new one and re-install. After running these two commands, you need to download the Google Software Update installer , if you don’t have it before, and open the disk image by double-clicking on the downloaded Google software update installer file. 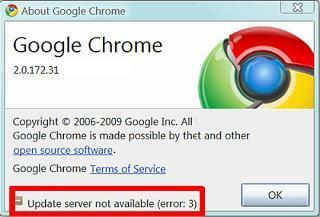 Follow the prompts on your screen in order to re-install your Google chrome server update. Eject the Google software update disk image and restart your Google chrome. The update server should be available after this final procedure, otherwise you may have to un-install your Google chrome and then download and re-install another updated version. [highlight color=”eg. yellow, black”]Error 12[/highlight]: This is another error code common in computers operating Mac operating systems. In order to fix the ‘Google Chrome Update Server Not available’ problem, you need to first of all locate the finder menu at the top corner of your window, Select “Go”, and select “ Go to folder” then Library and then “Caches” . Once you are in caches, simply delete these files ; com.Google.Keystonecom, and com.Google.UpdateEngine. After deletion, proceed to update your Google Chrome once again and the issue should be resolved. If the above procedure does not work, you can try fixing the problem with solutions suggested for errors 10 and 11. Fixing the issue of Google chrome update server not available may take longer than usual because of the fact that there are numerous problems that can cause the issue. You may also try and check some recent software downloads you have installed and see if such software are interfering with effective functioning of your Google chrome. Sometimes, inability on your browser/internet connection’s part or necessary Chrome update neglect may trigger this error. Make sure you visit related forums online and tech related websites for more information about this problem. You may also visit Google chrome website for updates and information.